You are invited to the Dolphin Festival, a family-friendly day packed with fun activities for everyone to enjoy. 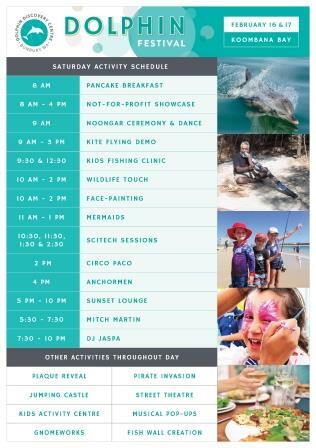 Kicking off at 8am with a pancake breakfast, the Festival will also include a Noongar ceremony and dance, two kids fishing clinics, mermaids, pirates, face painting, a chance to meet some native animals and heaps of other entertainment, as well as food stalls, a sunset lounge and so much more! Recfishwest will be delivering two beginner fishing clinics for all ages; be there for 9.30am OR at 12.30pm. Up to 30 participants per session – all rods and gear is provided. Make sure you have a hat on and we will have sunscreen for you!